The lane assist system assists the driver in keeping the vehicle in the right lane. The system uses a camera to detect the markings of the lane you are driving in. If the vehicle approaches one of the detected lane markings, the steering wheel vibrates to warn the driver that the vehicle might be about to cross one of the markings. The lane assist system is functional when it has detected lane markings on both sides of the lane you are driving in. 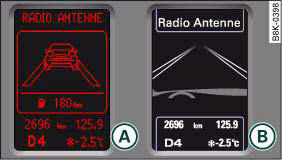 The green lamp in the instrument cluster indicates that the function is activated and fully functional. If you operate the turn signal before crossing one of the lane markings (while the lane assist system is functional), the system will detect that the lane change is intended and will not warn the driver. As the system is designed for driving on motorways and other major roads, it is only active above a speed of about 65 km/h. • The lane assist system does not keep the vehicle in its lane. It merely warns the driver when the vehicle is in danger of crossing the markings of the lane. As the driver you are always responsible for staying in your own lane. • The camera cannot detect all lane markings. Therefore it is possible that variations in the road surface or objects might be detected as lane markings, which can lead to false warnings, or warnings not being given. • The camera's view might be obstructed, for example by vehicles travelling in front, rain, snow, a lot of water on the road or adverse light. This can result in the system not detecting the lane markings correctly. – Press the button ⇒ fig. 158 -arrow- to switch the system on and off. The indicator lamp in the instrument cluster will light up or go out. Active: The green indicator lamp confirms that the system is fully functional. You will be warned if you are about to cross the lane markings detected by the system. • There is only one or no lane marking. • The system cannot detect the lane markings (e.g. due to snow, dirt, wet conditions or adverse light). • There are more than two lane markings in the lane you are driving in (e.g. in roadwork sections). • The vehicle's speed is below 65 km/h, the speed at which the lane assist system is activated. • The lane is narrower than 2.5 m or wider than 5 m.
• The bend is too tight. • Make sure that the camera window, fig. 159 is not covered with stickers or similar objects. • Always keep the camera window clean. Usually it should suffice to operate the windscreen wipers. 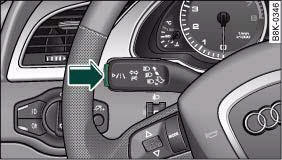 You can call up the display for the lane assist by repeatedly pressing the RESET button on the windscreen wiper lever. For more details refer to. 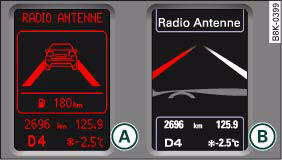 When the lane assist is switched on, two lines indicate the lane demarcations on the left and right of your vehicle. • Solid red lines: The lane assist is switched on and ready to warn. • Solid white lines: The lane assist is switched on and ready to warn. • Solid red line (left or right): The lane assist warns you before you cross the lane demarcation, fig. 160. • Unfilled lines: The lane assist is switched on but not ready for warning ⇒ page 146, fig. 161. • The outside of the camera window, fig. 159 is dirty or frosted. Please remove dirt or ice from this area of the windscreen. • The inside of the camera window is misted up. In this case, please wait for the camera window to demist before switching on the lane assist system again. • Due to the conditions (e.g. snow-covered road) the system has not been able to detect the lane markings for a long period. Do not switch the lane assist system on again before the lane markings are discernible. A temporary error is preventing the lane assist system from fully functioning. Try switching on the lane assist system again later. The system should be checked by an Audi dealership or other qualified workshop. You can change the lane assist settings on the sound system or MMI* to suit your individual preferences. – Select: Function selector button CAR > Audi lane assist. early: In this setting, the driver will be warned before a wheel crosses a lane marking. The warning depends on the angle with which the vehicle is approaching the lane marking. The larger the angle with which you are driving towards the marking, the earlier you will receive the warning, i.e. the distance between the vehicle and the marking might still be still relatively long. 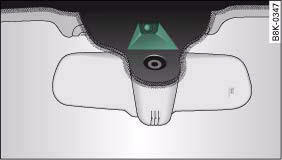 If you are driving toward the marking at a very narrow angle, you will receive the warning later, i.e. shortly before one of the wheels touches the marking. adaptive: In this setting, the time of warning is adapted to the road layout and the vehicle's speed. The warning will be received later when you are driving through a bend, and earlier when you are driving on a straight section. On narrow roads, the system will give off warnings later than on wide roads. late: In this setting, the driver will be warned when a wheel crosses a lane marking. You can set the steering vibration to low, medium or strong. The steering wheel will vibrate so that you can check your selection. • The lane assist is not active while you are changing the setting; the brief vibration of the steering wheel is only intended to help you make the desired setting.